~ Still many of you leaving comments as ANONYMOUS. 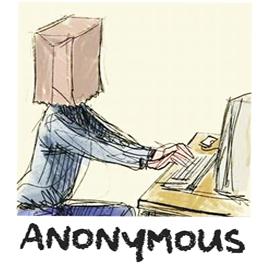 ~ I have stopped publishing comments by Anons for a while now. If you wish to have your views published in my Comment Box, please use a nickname, at least, even though I would encourage you to use your real identity. ~ There are several serial commenters (people who leave up to a dozen comments because they have nothing better to do or they really love writing) out there. I have dealt with many in the past and usually what I do is to publish the most relevant of their comments without editing them. ~ Some of the nicknames come in only to abuse me. Sometimes I publish their comments because I understand their need for attention. Perhaps I would be helping them let off some steam and that way they won't beat up their kids or abuse their wives or they would get over that bitter divorce or they don't commit suicide. ~ Sometimes I don't give a damn. I hope you my dear Readers understand. Happy National Day to my Singaporean readers. "Sometimes I publish their comments because I understand their need for attention. Perhaps I would be helping them let off some steam and that way they won't beat up their kids or abuse their wives or they would get over that bitter divorce or they don't commit suicide. ~ Sometimes I don't give a damn. I hope you my dear Readers understand." Happy 51st to our southern neighbours. Mallot's first job was in the CORDS program in Vietnam. So, is he a spook? Most definitely la. Or at least he has Spooky skills. CORDS stands for Civil Operations and Revolutionary Development Support. The objective of CORDS was to gain support for the government of South Vietnam from its rural population which was largely under the influence of or controlled by the insurgent communist forces of the Viet Cong and the People's Army of Vietnam (North Vietnam Army). The CORDS parent organisation is called Military Assistance Command or MACV. "Perhaps I would be helping them let off some steam and that way they won't beat up their kids or abuse their wives or they would get over that bitter divorce or they don't commit suicide."